At the time of its independence in 1960, Senegal’s economy was riding high, buoyed by successful exploitation of its rainfed agricultural resources as well as the wealth of its ocean fisheries. Senegalese farmers produced nearly a quarter of global peanut exports as well as a wide diversity of crop and livestock products for domestic consumption. The country’s fisheries enabled domestic commercial and artisanal fishing fleets as well as foreign vessels to capture high-value tuna and other species. Mining and export of phosphates also contributed to national productivity. Industrial processing capacity for both peanuts and fish was strengthened in the 1960s and 1970s to add value to local production. During the 1970s and 1980s, the Government of Senegal, with significant donor support, invested heavily in irrigation development in an effort to counter the negative effects of increasingly frequent droughts on agricultural production. The development of the Senegal River Basin, a resource shared with neighboring Guinea, Mali, and Mauritania, was intended to boost production of rice, fast becoming the staple food of choice in the country’s rapidly growing urban areas, and to generate energy through hydropower to support urban and industrial growth. In spite of these initiatives, the economy weakened steadily throughout the 1990s, and by 2000 Senegal was ranked as a least developed country with a per capita income of less than US $500. Analysts provide varied insights into this state of affairs. The world market for peanuts had evolved in directions not taken by the Senegalese industry, leading to a loss of competitiveness: the production sector was poorly organized; it was not well supported by research and development efforts; and production was buffeted by bad weather, pests, and infection with aflatoxin. The irrigation developments in the Senegal River Basin resulted in unanticipated challenges: disruption of longstanding crop-livestock relationships that had supported amicable cross-border production patterns for decades; inadequate understanding of the region’s hydrology and agronomy led to ineffective design choices; and misreading and mismanagement of land tenure/land access issues contributed to a short but destructive conflict with Mauritania as well as unrealized production increases. The potential for irrigation development in the Casamance River Basin was not pursued as vigorously, further fueling a low-level civil conflict in that region. Deforestation and soil degradation resulted from shifting policies with regard to land and forest management and lack of policies targeting grazing land. This diminished the prospects for a turnaround in trends in rainfed agriculture and livestock more generally. The country’s economic recovery since 2000 is attributed variously to new political leadership, resolution of the Casamance rebellion, better weather, and increased emphasis on the role of the private sector in driving investment and growth. The newest strategy for boosting economic growth involves greater exploitation of Senegal’s mineral reserves, with foreign investors expected to provide much of the capital and expertise. Currently, gold is extracted by small-scale artisanal miners, and phosphates are extracted only in regions near the coast. More significant investments in resource extraction in inland regions of the country (gold, phosphates, iron ore, marble, zircon, and a variety of other minerals) will require greater investments in transportation infrastructure as well as governance mechanisms to ensure that benefits are widely shared among the populace. Senegal appears poised to continue refining its development strategies over the next decade or two in order to increase income levels. Issues with regard to property rights and resource governance will come to the fore as minerals exploitation is prioritized. Given the critical importance of agriculture to employment, however, attention to governance of these resources will also be needed to ensure that productivity is increased enough to allow those working on farms to earn incomes adequate to escape from poverty. As the Millennium Challenge Corporation (MCC) Compact with Senegal indicates, attention to individuals’ land tenure and property rights will be important for agricultural production. Good governance will also take into account the way that benefits generated in one sector are shared more broadly across the population. Senegal’s policy of decentralization with regard to land administration, implemented over the past 45 years, has not, in general, resulted in greater local control, more productive and/or sustainable land use, or greater security of family or individual tenure. Customary law continues to prevail in most rural areas, but a great variety of approaches is being applied. The rights of women and youth to land and incentives to use it sustainably are not always in place. In urban areas, there are high levels of informal transactions. Where land rights were complex, as in the Senegal River Valley, state-led investments have replaced customary tenure with new systems, but security of rights remains an issue. According to a 2006 USAID report, the current land tenure system is an impediment to long-term investments in land enhancement and improved land stewardship. Repeated use by the state of measures that permit land to be reclassified as subject to allocation by the state rather than the local government councils (declaration of zones pionnieres) and expropriation of land for development have further undermined the decentralized approach. As the government now seeks to expand investments in transport infrastructure and to attract foreign investors into the mineral sector, these issues will continue to pose problems. New legislation that protects the rights of small landholders and pastoralists in rural areas – as well as the appropriate implementation and enforcement framework – at the same time as these important new initiatives are undertaken will be important to building food security and encouraging investment by small farmers in support of the government’s goal of revitalizing rainfed agriculture. Donors can help to foster the consultations with local rural councils, administrations, traditional leaders, and extended households that are needed to develop a new, integrated land policy approach that provides an adequate land-allocation process for development purposes while safeguarding the rights and incentives of customary stakeholders (USAID 2006, 7). The government’s land and forest management policies have delegated authority to rural councils to administer and allocate land and natural resources. However, the capacity of these councils is weak and they are not always capable of responding to rapidly-changing conditions such as demographic pressures, urbanization, economic activities, and patterns and performance of agricultural production. In addition, rural councils have not recognized or promoted women’s access to and rights in land, a step that could, in some areas, increase both productivity and household incomes as well as sustainable land management practices. Donors could support the technical and analytical capacity of rural councils to better define and understand the challenges in their areas. Donors could also help the government to build council capacity by offering training on key issues, including encouraging inclusivity and in particular addressing the land/forest resource needs of rural women. With the aim of aligning Senegal’s statutory laws and customary practices with its constitutional precepts regarding equal rights of men and women to land, donors could fund further research into the effects of laws on women, families, and communities. Donors could organize forums to discuss changes that would strengthen recognition of women’s property rights. USAID could also build on its successful community-based natural resource experience to create education programs aimed at empowering women to participate in the work of, and to assume roles on, the rural councils. In principle, rural councils and communities were granted forest-resource control rights and responsibilities in the 1998 Forest Code. Community-based forest management has been shown in donor-supported programs to be a viable option in Senegal. However, in communities not supported by donors, rural councils have often found that national decision-making predominates. Given the strong threats to the sustainability of Senegal’s forest resources, donors should promote the idea of a new approach to forest conservation and management as part of a larger reform of land law and administration. Senegal became independent of France in 1960, starting its national life as a relatively prosperous country with an economy based on the exploitation of its rainfed agricultural resources. Senegal now faces the challenge of recovering from economic reversals experienced in the 1980s and 1990s. Most observers conclude that the agricultural sector’s competitiveness has been eroded and needs to be rebuilt if poverty-reducing economic growth is to be realized. While the potential for intensification of agriculture is high, farmers and livestock owners are facing serious challenges: increasing demographic pressure, insecure land tenure, soil and pasture degradation, increasingly variable rainfall and inadequate irrigation management, and a changing policy environment. Urban areas have experienced rapid growth in recent decades. Over 20% of the country’s 12 million people now lives in the capital city of Dakar, drawn by the promise of greater employment and education opportunities. Sixty percent of Senegal’s population is expected to reside in cities by 2015. In rural areas, by contrast, two out of every three people live in poverty, reflecting the lagging growth in the agricultural sector. The legal framework of Senegal’s land regime consists of multiple civil laws, religious law, and a long history of evolving principles of customary law. In the 50 years since independence, Senegal has pursued a decentralized model of governance, granting additional powers to local democratically elected bodies, including rural councils and water user associations. In many communities, rural hierarchies based on family lineage, religion, and political party membership dominate these bodies and control access to natural resources and retention of rights. Veto powers retained by the central government create further challenges to representative local governance of rural land. In urban areas, Senegal’s progressive legislation allowing for the systematic regularization of land rights in informal settlements has lacked the financial and human resources support necessary for implementation. Senegal’s forest laws recognize the critical role that communities can play in managing the country’s forests, and donor-supported community forest management programs have successfully worked with communities to develop sustainable forest management programs. Beyond these programs, however, there is little evidence of any significant devolution of authority over forest resources to local communities. The privatization of Senegal’s system for water supply and distribution has been an African success story, resulting in more than US $400 million in benefits, realized primarily by consumers. Urban areas are close to receiving complete water coverage; rural access has risen significantly and is a government priority and the subject of ongoing programs. The country is expanding irrigation in the Senegal River Valley to take full advantage of the quota allotted by the multi-country Organization for the Development of the Senegal River (OMVS). The Senegal River, which has decreased in volume over the last decades, has not supplied the amount of hydroelectric energy anticipated when OMVS constructed two large dams and a power plant. Phosphates have dominated Senegal’s mineral sector, with phosphate exports following fish products as the second most important source of revenue. New phosphate reserves have been identified and are being brought into production. Reforms to the legal and regulatory framework governing the mineral sector, a program designed to map mineral deposits and create a cadastre, and development of some much-needed infrastructure are combining to attract more foreign investment: a gold mine began production in 2009, and construction of a large operation to extract iron ore is underway. The total land area of Senegal is 196,720 square kilometers. The country’s population is estimated at 12.2 million people (2008). Fifty-eight percent of the population is rural, and two-thirds of the rural population lives in poverty. Of Senegal’s US $13.2 billion GDP (2008), 62% is from services. Although over 60% of the population is employed in the agricultural sector, only 15% of GDP is from agriculture. Industry comprises 23% of Senegal’s GDP. While there has been positive economic growth since 2000, the UNDP ranked Senegal 166th out of 182 countries in the 2009 Human Development Report (World Bank 2009a; EIU 2005; UNDP 2009; World Bank 2006a; ADF 2005). Senegal has 531 kilometers of coastline, and fishing is the leading industry. Fish supplies about 75% of the population’s animal protein and is also the country’s leading export, accounting for between 22 and 30% of export earnings in the 2001–2008 period. The industry directly or indirectly employs about 600,000 people, 15– 17% of the country’s workforce (Niang 2005; USDOS 2010a). Senegal’s topography is comprised of low rolling plains with foothills in the southeast; the highest point is 581 meters. Of Senegal’s total land area, 43% is classified as agricultural; 13% of total land is considered arable (i.e., cultivable under rainfed conditions). Sixty-five percent of agricultural land is classified as pasture or grasslands. Seventy-five percent of arable land is in the central western region, known as the Peanut Basin, and the Casamance region south of The Gambia (World Bank 2009a; ADF 2005; UNSD 2009). Senegal’s primary cash crops are groundnuts, cotton, and horticulture. Groundnuts are grown in the central region, particularly in the Peanut Basin, and horticulture is concentrated in coastal regions. Sorghum and millet are grown in the northern and central regions, and rice is grown in the southern Casamance and Senegal River Valley. Maize and cowpeas are common subsistence crops. The country has a livestock population of 13.1 million, and most farms keep some livestock. Historically, pastoralists moved herds seasonally across large areas of the country, taking advantage of Senegal’s varied vegetation and rainfall. Over time, most livestock operations have become more sedentary, with herd movement restricted to relatively small areas (EIU 2005; Freudenberger and Freudenberger 1993). Soil fertility in Senegal is generally low, and soils are highly depleted due to erosion and unsustainable farming practices. Countrywide, 4.8% of all cropland is irrigated; the amount of irrigated land is slightly higher than the average for sub-Saharan Africa, reflecting the government’s commitment to irrigation infrastructure at various times in its history as well as the water resources available in the Senegal, Saloum, Gambia, and Casamance river basins. Forests cover 45% of the total land area, and deforestation is occurring at a rate of 0.5% per year. Nationally protected areas comprise 11% of the total land area and include the 913,000-hectare Niokolo Koba National Park in Tambacounda. Senegal has 1049 square kilometers of sandy dunes along its coast and about 4000 square kilometers of estuaries and tidal flats (Tappan et al. 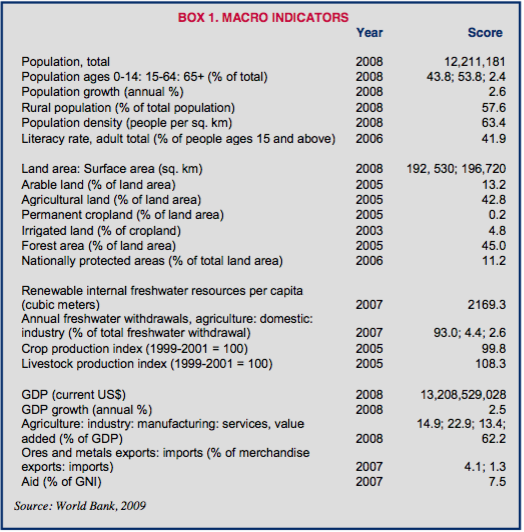 2004; World Bank 2009a; Wood et al. 204; ADF 2005; UNSD 2009). Senegal’s 13 ecoregions have experienced slight to moderate changes over the period from 1965–2000 due to a general decline in rainfall and periodic extreme droughts. Soil fertility in the Peanut Basin has declined, and cultivation of the northern sandy pastoral region of the country has increased. Some farmers have migrated south, opening up new areas for agriculture by clearing forests and woodlands. Drought and increased salinity of groundwater have reduced the extent of mangrove forests in coastal estuaries, and erosion of plateaus and watersheds has increased silt in valleys and lowlands (Tappan et al. 2004; ADF 2005; USAID 2006). Urban areas have experienced rapid growth, which is expected to continue; by some estimates, 60% of the population is expected to reside in cities by 2015. Dakar is the largest metropolitan area, housing 20% of Senegal’s total population and 50% of the country’s urban population. The city has sprawled outward in informal settlements characterized by little or no infrastructure. Other urban areas are much smaller (World Bank 2007; World Bank 2006a; World Bank 2002). There are about 20 different ethnic groups in Senegal, the largest being the Wolof (43% of population). Other groups include Fulani (also known as the Fulbe or Peul), who make up about 24% of the population, Serere (15%), Diola (5%), and Mandingo or Malinké (4%). Lesser groups are the Soninké, Toucouleur, Bassari and Dialonké. Traditionally, the three largest groups tended to be associated with certain regions and livelihood systems. The Wolof were primarily farmers, with the largest concentration in the northwestern region of the country. The Fulani are traditionally associated with pastoralist livelihoods. The Serere engaged in both cultivation of land and livestock production and were concentrated in the Peanut Belt. Migration among areas and between groups has become more fluid as the populations have responded to economic, social, and political changes. In the northern region of the country, rural livelihoods that were traditionally centered on pastoralism and on seasonal transhumance became more sedentary as a result of the creation of boreholes providing reliable water sources for watering livestock and irrigating crops and pressure from expanding cultivation, especially in the Peanut Basin and around water sources (Monkam 2009; EIU 2005; Furth 1998; Cotula 2006; Freudenberger and Freudenberger 1993). Ninety-five percent of Senegal’s farms are smallholdings, with farm size ranging from 1.5 to 5 hectares. The remaining 5% of holdings are larger farms. Large national and international agribusinesses have had a presence in Senegal since at least the 1930s. The largest farms have concentrated operations in the Senegal River Valley, the land around Dakar and coastal areas, and in the Casamance, although agribusinesses have also begun to invest in more remote areas (ADF 2005; FAO 2005a; Freudenberger and Freudenberger 1993). Informal settlements make up 25% of urban land in Senegal. Thirty percent of the residents of the capital city of Dakar live in informal settlements, often with no, or limited, access to services. From 1960 to 1987, Senegal’s government undertook large-scale slum clearance efforts, but informal settlements continued to spread, and the government faced increasing vocal public criticism of its actions. In 1987, the government adopted a progressive policy of systematic regularization of informal settlements and planned to provide upgradeable, 50-year rights of occupancy to 41,000 households. As of 2007, however, only about 1600 plots had been regularized under the program (World Bank 2002; Durand-Lasserve and Ndiaye 2008). Articles 8 and 15 of the Constitution of the Republic of Senegal (2001) provide for fundamental economic and social rights, including the right to property (GOS Constitution 2001). Under colonial rule, customary law jurisdictions were permitted to coexist alongside a French-modeled legal code. In 1964, the government passed the National Domain Law, which was intended to break the grip of traditional ethnic and religious hierarchies over land access, to encourage productive use of land, and create an economic environment conducive to agricultural exports. The National Domain Law classified about 97% of all land in Senegal as state-owned; the 2–3% of land that had been registered as freehold during the colonial era remained under private ownership. The National Domain Law classified land as within urban, classified, agricultural, or pioneer zones. The law also decentralized control over land to local governance bodies (municipalities and rural communities) (Monkam 2009; Bruce et al. 1995). The Rural Community Law of 1972 (Loi relative aux Communautés Rurales) provided the structure for the elected rural councils (counseils ruraux) and the ambit of their authority. As the representative of the rural community, the rural council has the authority to allocate use-rights to land, conditional upon the landholder’s economically productive use of the land. The concept for productive use of land is not defined in the law; the rural council establishes criteria based on local development plans. Natural persons and legal entities can obtain long-term, heritable use-rights to rural land, subject to a productive use requirement. The rural council has the authority to retake land that is not used productively and allocate it to other users. The law requires all land transactions to be conducted through and recorded with the rural council, and the rural council has authority to decide land disputes in its jurisdiction. The rural council’s authority is circumscribed by the central government, which retains the right to veto the decisions of the rural council. Officials of the Ministry of the Interior (e.g., sous-préfets, préfets) have exercised the authority to trump decisions considered contrary to protection of the state’s interest in natural resources (Bruce et al. 1995; Faye 2008; Monkam 2009). Law No. 76-66 of July 2, 1976 extended the state’s public domain to include subsurface land, inland waters, ocean shores, and offshore waters. The law also identified types of land tenure: authorized occupancy, leases, and land concessions (Bruce et al. 1995; Furth 1998). Decree No. 80-1051 of 14 October 1980 gives the préfet (local official of the central government) the authority to define the minimal conditions for productive use of land with reference to the conditions of the local area. The extent of use of this provision is unknown (Bruce et al. 1995). Decree 80-268 of 1980 prohibits clearing and cultivating natural pastures and calls for the creation of district-level pasture conservation committees. The decree has had little reported positive impact on the protection of pastureland, at least in part due to the failure of the decree to define natural pasture and the lack of representation of herders and pastoralists on the pasture conservation committees (Furth 1998). The Decentralization Law, Law No. 96-06 of March 22, 1996, clarified the subnational governance structure at the regional and commune levels in both urban and rural areas. In urban areas, communes are governed by elected municipal councils. Municipal councils have input into local planning and can apply for use of state land for infrastructure development, but the central government retains primary control over urban land. Rural communities are governed by elected rural councils, which are responsible for the allocation of rural land rights and establishment of agricultural production standards in rural areas (Faye 2008; Monkam 2009; Freudenberger 2009; World Bank 2002). Two decrees focus on urban land. First, Decree No. 91-386 of 1991 provides for the regularization of rights to plots in informal settlements and upgrading of services and facilities. The decree characterizes regularization and upgrading of informal settlements as an issue of public utility, thus permitting the state to expropriate land in areas designated for urban renewal without following the procedural requirements and specific showing of public interest. Second, Decree No. 91-748 of 1991 sets out the procedures governing the registration of ownership, leases, and occupancy rights to urban land, including regularization of informal settlements (World Bank 2002; Durand- Lasserve and Ndiaye 2008; Monkam 2009). The 2004 Framework for Agro-Sylvo-Pastoral Development is a wide-ranging statement of policy regarding the development of rural land. The statement recognizes the importance of support for family farming, development of commercial agriculture, protection of the country’s forests, use of water resources, promotion of social equity, development of the livestock sector, and need for secure land tenure. The statement establishes a national council on Agro-Sylvo-Pastoral Development. Implementing legislation for the framework has not yet been enacted (GOS Loi 2004-16 2004b; WFP 2009; Cotula et al. 2009). Despite the efforts to control land tenure in Senegal through a framework of formal law, customary law continues to govern land rights and the transfer of land in much of the country. In Senegal’s highly-stratified society, customary practices tend to favor elites (i.e. elders, and religious and political figures) at the expense of lower-caste farmers. The outcome of purportedly democratic elections of rural council members is strongly influenced by candidates’ social status and political party. The council members, who wield the power to manage territorial lands, may themselves serve as elite landholders and village chiefs, and it is common for them to approve tacit land sales and leases, circumvent legislation, and engage in other corrupt and self-serving tactics in many areas (Faye 2008; Cotula 2006). Informed observers and stakeholders recognize the centrality of the land tenure issues to rural development in Senegal and agree on the insufficiency of current legislation to meet the difficult land issues currently facing the country. Land tenure insecurity has resulted in increasing degradation of forests and other natural areas due to encroachment, as well as a growing number of land-based disputes. Open-access rules and practices on public lands lead to a tragedy of the commons situation. The current system excludes pastoralists from securing land rights. Large areas remain under de facto control of pastoralist Fulani clans, especially in the northern Ferlo region, but the land is under intense pressure from expanding cultivation and degradation of the shrinking expanses of grazing land (Cotula and Toulmin 2004; World Bank 2002; Faye 2008; USAID 2006; Freudenberger 2009). Senegal’s land is classified as in either the national domain or the private domain. Land in the national domain includes state land, which is further classified as either non-transferable public land or transferable state land. Land in the private domain is land held by individuals or entities under registered title documents. At the time of the National Domain Law in 1964, only 2–3% of land was registered as private freehold land. The amount of registered freehold land is growing, but the current percentage of registered privately owned land is unknown (Durand-Lasserve and Ndiaye 2008; Monkam 2009). Senegal’s land is also classified by zone: (1) urban zones (zones urbaines) are urban areas or community settlements; (2) classified zones (zones classes) include land that is governed by specific statutes, such as classified forests, national parks, and other government protected areas; (3) territorial lands (zones de terroir) include agricultural land (including pastureland) and non-classified forests in the national domain; and (4) pioneer zones (zones pionnières), which includes all remaining land. Rural councils have rights to manage and allocate territorial lands; pioneer zones are controlled by the central government. The central government has the authority to designate selected territorial land as needed for public utility and reclassify them as pioneer zones, thereby removing them from the jurisdiction of the rural councils (Monkam 2009; Faye 2008). Ownership. Natural persons and entities can own land under formal law and have all freehold rights, including the right to exclusive possession, use, and transfer (Monkam 2009). Leasehold. Natural persons or entities can obtain leaseholds of private land or land in the national domain that is transferable. Leases can be granted for terms up to 30 years and are renewable (Monkam 2009). Occupancy rights. The formal law recognizes two types of occupancy rights on urban and peri-urban land: surface rights and occupancy under administrative certificates (ACs). Surface rights are granted for urban land for periods of 50 years, with one 50-year renewal. The state grants surface rights for urban areas that are planned for development or informal settlements that are identified for upgrading. Surface rights cannot be transferred during the first five years but are fully transferable thereafter. Holders of surface rights can apply for freehold ownership rights upon payment of fees, taxes, and the administrative cost of the land. Occupancy under administrative certificate is a temporary, revocable right granted by the government for occupancy of public land. In the event the land is developed in accordance with a sanctioned plan, the AC may be converted into a leasehold (Monkam 2009; World Bank 2002; Durand-Lasserve and Ndiaye 2008). Land-use allocations under customary practices. The National Domain Law permits rural councils to allocate territorial land for use under customary principles so long as the land is used productively. Occupants of land for three or more years can apply for use-rights, regardless of competing claims of customary ownership rights (Furth 1998; Bruce et al. 1995). Most of the land in Senegal continues to be governed in large measure by customary law. In rural areas, land is held communally by families and lineages, although over time rights have become highly individualized. Loans, leases, and gifts of land governed by local customary law are common in most parts of the country. About one- third of land in urban areas is in informal settlements. Some residents claim rights to their plots pursuant to an occupancy certificate issued by the government or informal documentation evidencing a land purchase or lease (Furth 1998; Monkam 2009). The primary means by which people access land in Senegal is through inheritance, leasing, borrowing, land purchase, and allocations from rural councils. Inheritance rights are governed in most communities by customary and religious law. Rights to land pass through generations, either through the father or mother’s lineage, depending on the local practice. Land access through land-leasing and purchases tends to be governed by blends of customary law and socio-political systems that have evolved with the changing land conditions and uses, migrations of populations, and adaptations of political and economic systems. The application of formal law and assertion of the authority of rural councils have created a pluralistic legal environment that is most marked in areas of development for irrigation or commercial agriculture where land rights are granted under formal law. In such areas, multiple land tenure systems may exist. The extent to which a community recognizes the authority of the rural council over land affairs is highly localized: in some areas, the councils may not be functioning; in other areas they may mirror the rural hierarchy, with local elites holding positions in both customary and formal institutions; and in other areas the councils may create separate seats of rural power (Cotula 2006; Furth 1998; Platteau et al. 2005; Golan 1994; Lavigne Delville 2000). The National Domain Law of 1964 envisions a land tenure system governed by formal law, in which access to land and registered land transfers are primarily managed by elected rural and municipal councils. Some rural landholders have received use-rights to land by allocations by rural councils pursuant to the formal law, and rural councils tend to exercise their authority within the existing customary land tenure systems (Bruce et al. 1995; Monkam 2009; Freudenberger and Freudenberger 1993). In urban areas, land rights regularization programs have granted 50-year surface rights to urban residents. However, lack of knowledge of or resistance to the authority of the formal law has led many landholders dependent on principles of customary law to support their rights to land. Land registration requires six procedures, an average of 124 days, and requires payment of fees amounting to 21% of the property value. Few landholders in rural or urban areas have registered their landholdings (Bruce et al. 1995; Monkam 2009; World Bank 2010c; Lavigne Delville 2000). Foreigners are permitted to own land in Senegal. Regulations generally require land purchased for commercial purposes to be acquired via a governmental body and developed according to specific requirements (Global Property Guide 2007). The decentralization of authority for land allocation to rural councils has created insecurity of land tenure in some cases. Rural councils have the authority to grant and withdraw land rights based on judgments regarding productive land use. The rural council establishes the standard for productive use based on land-use plans, allowing for extensive exercise of discretion. The requirement for productive use has not generally included natural forest management or pastoralism, putting the highest value on land cleared and put under intensive cultivation. Councils dominated by local elites may use authority to allocate valuable land, such as irrigated parcels, to powerful outsiders, including commercial interests, in contravention of statutory requirements granting local communities rights to irrigated land. In the Peanut Belt and Senegal River Valley, rural councils have allocated substantial amounts of forestland to members of the Mouride Brotherhood (one of the three major Sufi Islamic sects), who dominate Senegal’s groundnut industry (Bruce et al. 1995; Freudenberger and Freudenberger 1993; Furth 1998; Cotula 2006). Territorial lands subject to the rural council’s authority are also subject to control by the central government, which can reclassify land as pioneer land and transfer rights to parties for development. The central government has used this mechanism in the Senegal River Valley to grant commercial interests rights to desirable farmland (Monkam 2009; Faye 2008). Senegal’s legislation supporting the regularization of land rights in informal settlements has not had the impact drafters intended. The government’s plan to conduct systematic regularization and upgrading of informal settlements has been delayed by lack of human and financial resources and complications in the procedures. Informal settlements often include residents and developers with a variety of rights, and different procedures must be followed depending upon whether the land has been registered as state land and whether title has been registered. Of those residents receiving 50-year surface rights, few residents have paid the fees to obtain ownership rights to their land. In informal settlements, most residents report that in the short term their customary rights are secure as against claims from other community members or migrants to the settlement; in the longer term residents recognize the value of formal rights (Durand-Lasserve and Ndiaye 2008; World Bank 2002). The 2001 Constitution guarantees gender equality, and national land policy appears to foster gender-neutral access to land. Despite the support for equitable access in the formal law, in large measure social and religious norms continue to dictate women’s land rights: most women access land through their husbands, and the security of their rights is dependent on maintaining the relationship with their husbands. Women often have authority to determine what crops they will plant and manage the cultivation, but their husbands or male relatives assert overall rights to the land. Upon divorce or if they are widowed, in most areas women can return to their natal home and access land for farming through their natal families or local officials and traditional authorities. However, the quality of land available to divorced and abandoned women and widows is usually quite poor (COHRE 2004; Dankelman et al. 2008; Platteau et al. 2005). The decentralization of land allocation authority to rural councils has not altered the effect of the customary and religious systems on land rights. Female representation on rural councils is rare, and councils frequently determine agricultural land-use rights with a male bias because they assume that males are responsible for planning and organizing productive use of the land. The land allocated women by rural councils tends to be smaller in size and less productive than plots allocated to men. Women are also far more likely than their male counterparts to be evicted from lands that they farm. Women generally plant vegetables and non-staple crops, while men grow maize or millet. When men claim a need for space to grow staples, women are often displaced, with or without formal approval by the rural council. Successful cultivation has become a disincentive for women: if their gardening plots appear too fertile, they are vulnerable to eviction so that men may use the land (Platteau et al. 2005; COHRE 2004; Dankelman et al. 2008; Grigsby 2004). In some areas, the National Domain Law has increased the insecurity of women’s land rights. Women and other marginalized groups that may not have access to the most productive land often reach agreements with landholders to farm underutilized parcels. The National Domain Law provides that cultivators who have used the same land for three years or more may claim long-term use-rights to the land. The provision causes some landholders loaning or renting land to women and other cultivators to reclaim their land before three years have passed in order to make sure the women or other cultivators do not obtain long-term rights to the land (Furth 1998). The Family Code (1973) regulates marriage, divorce, succession and custody, with a separate section for Muslim Succession Law. The Family Code abrogates previous versions of formal law and all general and local customs apart from those regulating the formalities of marriage. In practice, however, customary law continues to govern many areas of family and personal law. For example, the Code bans marriage for girls under the age of sixteen, but in many rural areas girls marry younger. Many Muslim leaders also continue to apply Islamic principles that were not included in the Family Code (Hunton & Williams 2004). The Family Code requires all citizens to register their marriages. Polygamy (up to four wives) is permitted, and husbands must register their intent to live in either a monogamous or polygamous marriage. About half of all women live in polygamous marriages. Husbands are the recognized heads of the household, and wives are required to live with their husbands. Husbands are permitted a quick form of divorce while wives must obtain a court decree allowing divorce. The law codifies Muslim laws of succession, which provide that female heirs receive half of the share of property that their male counterparts receive. In polygamy marriages, widows must divide the single female share of the estate (COHRE 2004; Platteau et al. 2005; Hunton & Williams 2004). Customary practices heavily influence women’s access to justice and ability to enforce their property rights. An estimated 70% of Senegalese women over the age of 15 are illiterate and have limited if any knowledge of formal law and judicial procedure. Even if women are able to assert their rights, their efforts may cause strong disapproval and ostracism from their local community, leaving them without social support (COHRE 2004; Platteau et al. 2005; Faye 2008). Senegal’s formal law – including the National Domain Law of 1964, the 1972 Rural Community Law, and the Decentralization Law of 1996, and multiple decrees – decentralized land administration functions to a subnational system of regional and local governing bodies (the commune in urban areas and communities in rural areas). Regional government has a broad mandate to support economic and social development, but has no separate source of revenue. At the community level, elected rural councils are responsible for land-use planning, establishing land productivity standards with relation to land-use plans, managing land allocations and unallocated land, maintaining public areas, and resolution of land disputes. Rural councils are also charged with responsibility for maintaining land records. The extent of delegated authority varies by land classification. Rural councils have authority over territorial land, but subject to the continued authority of the central government, which can veto rural council actions. Rural communities have the power of taxation, although few are able to use it effectively, and rural councils suffer from lack of financial support (Monkam 2009; Bruce et al. 2005; Faye 2008). The central government also retains full authority over pioneer land, has the power to identify territorial land for reclassification as pioneer land, and retains primary authority over urban land. The two ministries most active in land matters are the Ministry of the Interior and the Ministry of Habitat, Construction, and Hydraulics. The central government has exercised its authority over land to support a range of development plans, including irrigation schemes and large-scale commercial and industrial development. The government established the Investment Promotion and Major Projects Agency (APIX) in 2000 as a one-stop shop for investors seeking access to land and assistance with administrative processes for land-based investments (Faye 2008; APIX 2010). Central-level institutions in charge of registration of private land rights and transactions in land are the Land Operations Control Commission (Commission de Contrôles des Opérations Domanicales – CCOD), the Director of Land (Directeur des Domaines) and the Collector (Receveur des Domaines) (Monkam 2009;World Bank 2002). Land in the national domain cannot be sold, limiting the formal land-sale market in Senegal is limited to privately held freehold land. Freehold land was estimated at 2–3% of total landholdings in 1964. The amount of registered freehold land has increased because some holders of surface rights have converted their rights to freehold rights. However, that number is presumed to be quite small due to the limited amount of informal settlements regularized and the high cost of obtaining freehold title (Monkam 2009; Durand-Lasserve and Ndiaye 2008). Senegal has an active informal market in land sales and leases. In many rural areas, unexploited rainfed land is available for allocation by rural councils or traditional authorities and thus lacks a market value. However, irrigated land, land identified for development projects, land with access to roads and railways, and land in peri-urban areas have become increasingly valuable and support a vibrant informal land market. Land also has non- economic functions in Senegal, including social functions (e.g. 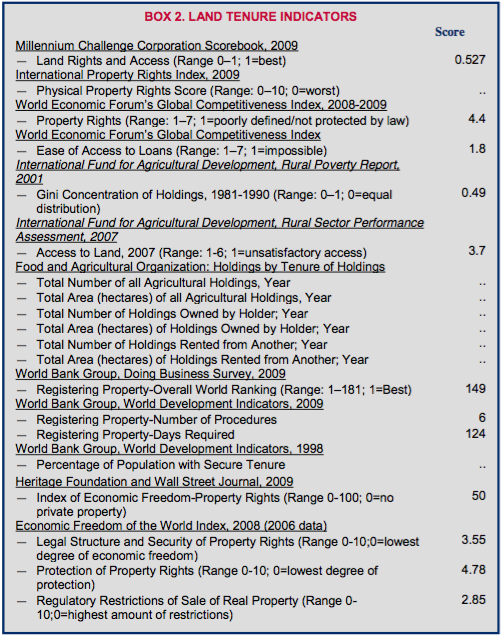 defining membership and status of land users and holders) and religious functions (e.g. mediating between the worlds of the living and the departed) (Cotula and Toulmin 2004; Cotula 2006; Faye 2008; Tzeutschler 1999). The inability of the formal legal framework to incorporate development of the growing land market in Senegal forces land transactions underground and outside the regulatory framework. Collusion between developers and elected officials is common in some areas, particularly where land is highly productive or well-suited to development and prized by investors (Cotula and Toulmin 2004; Cotula 2006; Faye 2008). One significant source of support for the land market in Senegal is remittances. A large proportion of Senegalese immigrate to other countries (particularly France) and send a recorded US $925 million annually (2007) back to families in the form of remittances; the amount of unrecorded remittances sent through informal channels may substantially increase that official figure. In some cases, emigrants also send money to rural councils and other government and development bodies. Research suggests that remittances may be a significant factor affecting Senegalese families’ access to land and tenure security by helping families obtain land allocations through rural councils, reclaim land previously lent to other families, purchase land outright, rent land from a village association, secure formal ownership of customary land, and invest in hired labor or capital assets, thus enhancing the productivity of the land and the security of their holding (UNDP 2009; World Bank 2006b; Cotula and Toulmin 2004). The Constitution of 2001 guarantees citizens the right of property, protecting it from infringement except in cases of public necessity. Government expropriation of land requires a showing of public necessity and payment of just compensation, which includes actual cost and earned value. Decree No. 77-563 of 3 July 1997 outlines the expropriation procedure under which the state can expropriate land for public utility and subject to fair and prior compensation. The law provides for establishment of a Conciliation Commission that is responsible for determining fair compensation. If the parties are unable to agree on an amount, an expropriation judge delivers a ruling. Either party can request the services of an evaluation expert, but once the expropriation judge rules, only limited grounds for appeal exist. Separate laws provide streamlined procedures for certain land expropriations, such as land-takings for regularization and upgrading of informal settlements (GOS Constitution 2001; World Bank 2008; Monkam 2009; Faye 2008; ADF 2008). At least with relation to large projects with reported procedures, recent governmental land-takings have been compensated in accordance with the law. Anecdotal reports suggest numerous cases of expropriations without payment of fair compensation. Municipalities can expropriate rural land for urbanization and often provide compensation in the form of upgraded land or alternate land. Arrangements are often unsatisfactory to rural landholders: in the Thies Region, the municipality expropriated rural plots averaging 2 hectares and offered the landholders plots of 15 square meters in exchange. Landholders were required to pay for the demarcation of their land and to meet productivity standards. With the support of local NGOs, rural landholders in some regions are negotiating with municipal and rural councils to protect agricultural land that is vulnerable to loss to expanding cities (ADF 2008; Tall and Tine 2002). The state does not generally use the expropriation procedure for irrigation projects because no transfer of land ownership takes place. The rural council exercises its power to withdraw land from users and turns the land over to the irrigation agency for development. The original landholders are not compensated for the land withdrawn, but they are usually allocated upgraded plots once the irrigation project is complete. The distribution of new plots is determined by various factors, including: family size; preexisting land rights; labor or cash contribution for the construction; capacity to use the land productively; and local residence. Some rural councils have allocated large tracts of land used by local communities to private investors. In some cases, communities have been able to negotiate for compensation paid by the investor (Sylla 2006; Cotula 2006). Land disputes are relatively common in Senegal and dispute-resolution procedures include formal and customary mechanisms and tribunals. One common cause of disputes is competition for resources between pastoralists and sedentary farmers. Many of these disputes center on access to water sources and grazing areas, especially in areas that were traditional grazing grounds that were brought under cultivation. In recent years, extreme soil depletion has pushed farmers in the Groundnut Basin toward areas of better quality soil, primarily in the south. As the population migrates, land disputes have increased, especially in trans-boundary areas (Furth 1998; USAID 2006; Adigbli 2009). Pastoral use of land has generally not been identified as a productive use of land by rural councils, and the pastoral conservation committees have often lacked representation of herders to defend and promote their interests. Local administrators are more likely to favor the sedentary electorate over migrating herders (Wood et al. 2004; Furth 1998). Disputes regarding rights to urban plots and urban expansion into rural areas are also common. In Ziguinchor, the capital of the Casamance, the municipality’s effort to impose a new urban plan on the city (which involved moving existing landholders to new subdivisions) resulted in hundreds of disputes. The municipality created two different arbitration boards to settle claims, but some cases lasted for years and remained unresolved when the board ceased functioning. More recent disputes between municipal developers and farmers arising out of urban expansion in Ties Region were brought before the municipal council, where the parties reached a negotiated agreement regarding plans for further urban expansion (Hesseling 1990). The use of alternative dispute-resolution systems such as an arbitration board and municipal council is common in Senegal. Urban land disputes are under the jurisdiction of criminal rather than civil court, and the commencement of a criminal action is a deterrent to many claimants. Those who do proceed often criticize the court as inefficient, corrupt, biased, and lacking necessary resources. Cases can take 3–5 years to resolve, and judgments are often difficult to enforce. An action to enforce a contract in Senegal requires an average of 44 procedures, 780 days, and payment of about 27% of the claim value in official and unofficial costs and fees (Global Advice Network 2009; Hesseling 1990; Durand-Lasserve and Ndiaye 2008). Senegal’s Casamance region was the locus of conflict for decades, beginning in the 1980s. The recognition of The Gambia to the north cut the Casamance off from the rest of Senegal, and a separatist movement for independence grew. A peace agreement was signed in 2004, and national programs to revive the region began (USAID 2006; ADF 2005). Since Independence in 1960, the Senegalese government has made multiple legislative efforts to increase rural land productivity, improve land tenure security, decentralize land administration, encourage commercial development, and support the interests of smallholders and pastoralists. Some efforts, such as the decentralization of land administration, have proved somewhat illusory because the central government retained significant authority. In other cases, implementing legislation has not been drafted, or funding has been insufficient to realize the progressive intent of the laws (Bruce et al. 1996; Monkam 2009; Durand-Lasserve and Ndiaye 2008). Much of the government’s focus on increasing land productivity has shifted to support for large-scale commercial development. With EUR €7 million in support from the Agence Française de Développement (AFD), Senegal is using the Agribusiness Real Estate Investment Trust (AREIT) model to encourage private investment in irrigated farming in the Senegal River Delta. The model, which has been used in Mozambique, involves establishing a long-term strategic commercial and technical relationship with an international partner. The partner provides capital, know-how, and access to markets for a period of at least 15 years. The producers provide the land, and the producers and investor for a joint partnership for development of the land and commercial enterprises (Sylla 2006). The African Development Bank (ADB) is funding the 5-year (2005–2010), US $13.5 million UAC Land Register and Cadastre Modernization Project, which is digitizing the land register and reducing processing time for land certificates. The project has hired and trained staff for the Survey Department, created a cadastre system and transferred data from pilot cities, and begun the digitization process. The German Agency for Technical Cooperation (GTZ)’s Support for Decentralization and Local Development Project is working with rural councils, providing capacity-building in governance standards and development of procedures for effective and efficient discharge of the councils’ responsibilities (AfDB 2008; GTZ 2009; AfDB 2010). The Millennium Challenge Corporation (MCC) signed a 5-year, US $540 million compact with Senegal in 2009, with the goal of reducing poverty and stimulating economic growth by boosting agricultural productivity, rehabilitating national roads, and improving irrigation and water resources management. The irrigation and water component includes specific guidelines designed to ensure that the project activities improve land tenure security and do not result in an adverse impact on land tenure security. Guidelines include identification of beneficiaries as those with existing land rights in the project area, and targeted beneficiaries such as poor women, landless herders, and landless agricultural laborers. The project will allocate plots of a size necessary to support a family and raise the family from poverty, and the project will support the transparent and accountable procedures of the relevant rural council or commune councils to manage the land allocations. Beneficiaries will have the option to title the land individually in the name of female farmers or jointly by married couples (MCC 2010). Access to water is critical to the livelihoods of the rural population in Senegal, and rainfall is the primary determinant of agricultural productivity. The climate in Senegal is Sahelian, with a rainy season from June to October and a dry season from November to June. Rainfall, which ranges from about 150 millimeters per year in the northern sandy pastoral region to 1400 millimeters a year in the Casamance, is highly regionalized and variable from year to year. In areas such as the Senegal River Valley and Peanut Basin, rainfall can vary 500 millimeters or more in a given year, ranging from 150 to 600 millimeters. Every region is receiving less rain due to climate change: in the period between 1965 and 1990, rainfall has decreased by about 200 millimeters per year countrywide. Periods of extreme drought also occur, most recently in the 1970s and 1980s (USAID 2006; Tappan et al. 2004). Senegal has four major rivers: the Senegal; Sine-Saloum; Gambia; and Casamance. Of the river basins, the Senegal River basin is the most important, covering about 37% of the total land area and sharing its water with neighboring countries (Guinea, Mali, and Mauritania). Senegal, Mali, and Mauritania founded the Organization for the Development of the Senegal River (OMVS) in 1972 to manage basin resources, with Guinea joining in 2005. The OMVS countries invested in the construction of two major dams designed to control the flow of the waters to supply year-round irrigation, to generate electricity, and control flooding. The Diama Dam near the mouth of the Senegal River on the border of Mauritania prevents saltwater intrusion into the lower portions of the river during the dry season; the Manantali Dam, which is near the headwaters of the Bafing tributary in Mali, is designed to capture and regulate the flow from the river’s source. Construction of the dams increased the availability of water for irrigation and drinking but also disrupted patterns of water use by crop producers and nomadic (or transhumant) livestock owners, degraded estuarine and floodplain ecosystems, and led to a rise in waterborne diseases. Planning for the Manantali Dam was based on hydrological data from earlier decades; current climate conditions have proved to be drier and, overall, projected capacities for both water and energy produced by the hydroelectric power plant built at Manantali have not been met (Duvail and Hamerlynck 2003; UNESCO 2009). Senegal’s renewable surface water resources are estimated at 24 cubic kilometers per year, and renewable groundwater resources total about 3.5 cubic kilometers per year. Water delivery is managed through a public- private partnership in Senegal, and privatization resulted in marked improvement in access to water and water quality, with about 90% coverage in areas and 65–75% coverage in rural areas. However, although overall access numbers are high, wide gaps in coverage exist between access to water in Dakar and other cities and between wealthier and poorer residential areas, and water coverage in some rural areas remains quite low (World Bank 2010a; Jammal and Jones 2006; FAO 2005b). Senegal’s estimated irrigation potential is about 340,000 hectares, but irrigation covers only 105,000 hectares, with a 60% exploitation rate. Many irrigated areas are poorly managed, allowing excessive runoff and heavy concentrations of salt. High development costs and inadequate user participation in water management have been blamed for these shortcomings (AfDB 2003). Under the Water Code of 1981 (Law 81-13), ground and surface water are considered a community resource held by the state in the public domain. The Water Code provides for management of water resources by central government agencies. Human consumption takes first priority for water-use, followed by: agriculture; agro-industrial purposes other than growing food; energy; mining; navigation; and tourism. Regulations implementing the Water Code are contained in Decrees 555, 556, and 557 of 1998 (Salman and Bradlow 2006; Cotula 2006; FAO 2005b). The legislative framework gives several different entities authority over rights to Senegal’s irrigated land and water. The central government has authority over water resources, including water used for irrigation. The government’s authority is subject to its status as a member of OMVS, which has a quota system for preventing unequal use of water from the Senegal River. Senegal has a quota of 80,000 hectares of irrigated land. The central-level agency, Société d’Aménagement des Espaces du Delta et de la Falémé (SAED), was originally responsible for managing irrigation schemes on all land in the national domain. Water User Associations (WUAs), federated bodies that are composed of several villages in a designated irrigation area, are responsible for allocating land and managing water resources on irrigated land subject to SAED authority (UNESCO 2009; Sylla 2006). Decree 87-720 of 1987 changed the land zone designation of many state-operated irrigation schemes from pioneer zones, in which land is under the control of SAED and WUAs, to territorial zones, which are managed by rural councils. The decree gave the rural councils authorization over land allocations in non-public irrigation schemes, while water rights remained governed by SAED and WUAs (Sylla 2006; Cotula 2006). The Water Code does not address water rights specific to the extensive pastoral regions of the country, where water access is often limited to boreholes and other constructed water points. Under the formal law, access to land and water are governed by rural councils and central government bodies, respectively. However, under customary law, the traditional Fulani herding clans generally control access to the water points and assert access rights to surrounding farmland (Freudenberger 2009). The Water Code permits fixed-term public concessions for water use by public institutions, national companies, public companies, and private entities. The concessions are fee-based, but in some cases the fee is subsidized, with commercial operators paying higher fees and garden and household users paying lower fees. Individuals generally pay for access to drinking water, which is distributed by the private operating company, Sénégalaise des Eaux (SDE), although some access in rural areas is free (World Bank 2010a; Salman and Bradlow 2006; GOS Water Code 1981). Landholders are free to use surface water accumulating on their land. A right to water can also be specifically and explicitly granted for farm, livestock, industrial, and tourism purposes. Outside these official channels, customary practices in managing water remain prevalent (GOS Water Code 1981). Water authorizations can be suspended or revoked by the Minister of Habitat, Construction, and Hydraulics in order to protect the resource from pollution, for the public interest, or if the holder of the right breaches the terms of authorization or fails to use the water-right. The Minister can initiate proceedings on any disputes or file any relevant claims against any person violating the water law within the judicial system (Salman and Bradlow 2006). Water User Associations (WUAs), with SAED oversight, are responsible for the allocation of land for public irrigation programs. The WUA is charged with responsibility for making allotments in accordance with principles of equity and fairness that provide all community members with the opportunity to develop and cultivate an irrigated plot in accordance with rules of a scheme. Access to water is managed in accordance with a water allocation plan drawn up by the WUA at the start of each season. The WUA collects water fees from each landholder and makes a collective payment to the funding body, the Senegal National Agricultural Credit Bank (Banque Nationale de Crédit Agricole du Sénégal). The WUA has the power to de-allocate land for failure to reimburse seasonal loans, breaches of water-use rules, or infringement of the internal regulations of the group (Sylla 2006). Decree 87-720 of 1987, which allowed the central government to rezone some irrigation-scheme areas so that management of land allocations falls under the jurisdiction of rural councils as opposed to SAED and the WUAs, separated authority for land allocations from authority over water allocations. The bifurcation has created some management difficulties. Some farmers have used the system to obtain double plots – one from a public scheme and one using land allocated by the rural council but taking unauthorized advantage of irrigation water supplied by the public scheme (known as pirate plots). WUAs have had difficulty enforcing compliance with user rules and water fees on pirate plots because they do not have the authority to withdraw the land allocation (Cotula 2006; Sylla 2006). The number of large national and international agribusiness enterprises in the Senegal River Basin is growing. In irrigated areas zoned as territorial land, rural councils have authority to allocate land to private companies. In some areas, a majority of the land has been allocated to agribusinesses and political elites, creating resentment within local communities. In a handful of reported cases, the resentment is compounded by a company’s exercise of exclusive control over one of the many small dams along the river, resulting in private corporate control of the flow of water (Sylla 2006). The Ministry of Habitat, Construction, and Hydraulics is responsible for water supply in urban and rural areas. Within the Ministry, the Directorate of Rural Hydraulics (DHR) is responsible for the planning, implementation and monitoring of new drinking water supplies in rural areas. The Directorate of the Operation and Maintenance (DEM) is responsible for technical support and advice to users’ associations and management committees, and control and regulation of public drinking water in rural areas. The Directorate of Management and Planning of Water Resources (DGPRE) is responsible for the inventory of works of groundwater abstraction, and monitoring quality and quantity of groundwater resources (GOS 2009; GOS 2010a). The government of Senegal contracts with the Senegalese national water company (Société Nationale des Eaux du Senegal, SONES) and SDE for water services. SONES is the holding company and is responsible for investments in infrastructure and management of SDE. SDE is responsible for water delivery operations, maintenance, system expansion, and billing and collection (World Bank 2010a). Water User Associations (WUAs) are federated organizations encompassing a group of villages and led by elected bodies. WUAs have the status of Economic Interest Groups (EIG), which allows them to liaise with financial institutions and perform management acts on behalf of their members. WUAs have concession contracts with SAED that set out the responsibilities of the parties. WUAs are generally responsible for maintaining irrigation and drainage networks and equipment, and developing a plan to ensure compliance with crop intensity standards set by SAED. SAED is responsible for helping the WUAs develop, equip, and rehabilitate the area and technical supervision and training of farmers in the new techniques, financial and accounting management, and environmental protection. As of 2006, SAED had transferred management of irrigation for 16,000 hectares of land in 25 irrigated areas to the management of 22 WUAs. Governing bodies of WUAs are often dominated by village elites and major political parties who use the association as a means to future their individual purposes, limiting the representative nature of the bodies (Sylla 2006). With the support of NGOs and international remittances, village residents in some areas have formed separate associations to manage irrigated land and water resources, adopting their own informal water fee systems (Cotula 2006; Sylla 2006). The restructuring of Senegal’s water sector and development of the public-private partnership between the GOS and SONES/SDE is considered one of the most significant privatization successes on the African continent. The restructuring of the sector resulted in a significant improvement in the distribution of water and the quality of water received, and the majority of the benefits, which are estimated at US $437 million, have been realized by consumers at all level of society. The significant achievement is attributed to a solid design that included consultation with all stakeholders, selection of appropriate regulatory principles, and use of a contract suited to the goals. The incentive structure applied in the contract between SONES and SDE is credited with the high level of achievement. Under the contract, the bulk of the water is paid at bid price, but at the margin SDE is either compensated or penalized at the full tariff rate, which is approximately twice as high. The contract set very high targets and provided a large incentive to achieve the targets – with a very impressive result (Jammal and Jones 2006). The 5-year (2010–2015) US $57 million Millennium Water and Sanitation Programme (PEPAM) is designed to provide 2.3 million rural residents with reliable access to drinking water, focusing on the areas of the Senegal River Basin (regions of Saint-Louis and Matam and the district of Bakel) where residents currently use untreated surface water sources for drinking. In the urban sector, the program plans to increase the connection rate in urban areas that are currently underserved (World Bank 2010a). The World Bank-supported Agricultural Markets Development Programme for Senegal (Programme de Développement des Marchés Agricoles au Sénégal, PDMAS) is a 10-year project that began in 2005 with the goal of increasing non-traditional agricultural exports from the 2005 level of 13,000 tons to 50,000 tons, and doubling participant producer revenues by the end of the program in 2015. The program includes a component focusing on irrigation, specifically: (1) restructuring the irrigation system in the Niayes areas with an independent water supply and management system; and (2) expansion of successful small-scale irrigation models. As of June 2009, a total of 568 hectares of improved irrigated schemes have been developed out of a 2015 target of 2500 hectares (World Bank 2005; World Bank 2009b). The 5-year US $540 million compact between MCC and the government of Senegal includes US $170 million for the Irrigation and Water Resources Management Project. The project is designed to improve the productivity of the agricultural sector by extending and improving the quality of the irrigation system in the Senegal River Valley. MCC plans to work with the government to develop up to 10,500 hectares of additional irrigated land by increasing the volume of irrigation water and preventing the abandonment of 26,000 hectares of existing irrigable land by rehabilitating drainage canals and providing secure land tenure for farmers, with particular attention to poor women farmers, landless herders, and landless agricultural laborers (MCC 2010). AfDB’s Local Small-scale Irrigation Support Project is working in 87 rural communities in the regions of Fatick, Kolda, and Tambacounda. The project is developing a planned 120 small structures and facilities (micro-dams, sills, deepening of ponds, bottomlands, micro-irrigated areas) to control surface water runoff, and is working to regenerate 2000 hectares of degraded land. GTZ has helped supply drinking water to all participating communities in GTZ’s 11-year (2004–2015) Support for Decentralization and Local Development project (GTZ 2009; AfDB 2008). Senegal has about 8.8 million hectares of forest, most of which is woodland with shrub and tree savanna vegetation, and is found primarily in the central and southern regions. An estimated 1.6 million hectares is primary forest, with broadleaf evergreen and semi-evergreen trees and mangroves, oil palms, and raffia palms located in the southern part of the country, primarily in the Casamance and in the coastal estuaries. Senegal’s forests are home to nine threatened species, including chimpanzee, red colobus, and wild dog. Forests provide Senegal’s human population with grazing land, fuelwood, food, and income from the sale of forest products (Boye 2003; IUCN 2008; FAO 2005a; Tappan et al. 2004). The national forest service has primary management authority over an estimated 6 million hectares of forestland, including about 210 classified forests (2.5 million hectares), six national parks, 20 silvo-pastoral reserves, eight special reserves, and a number of reforestation and rehabilitation areas. The balance of the country’s forestland is primarily under control of local communities and forestland users. In some areas, rural councils, village forest committees, clans, and other local bodies exercise authority over the forestland; elsewhere the land lacks organized management and is essentially an open-access resource (Diaw 2006; Boye 2003; Ba 2006). In 1990, 65% of Senegal’s total land area was covered in forest; by 2005 that figure had fallen to 45%. The deforestation rate is currently about 0.5% per year. Consumption of charcoal and firewood for domestic energy causes substantial degradation, and clearing forestland for cultivation, often using slash-and-burn techniques, has caused substantial deforestation. In one notorious case, the Mouride Brotherhood entered into a contract with the government to cultivate a portion of a 73,000 hectare that was gazetted as a reserve and used for grazing by an estimated 6000 pastoralists and 300,000 cattle. Over the course of a three-week period in 1991, members of the sect cleared 43,000 hectares for groundnut cultivation and allotted plots to members, forcing the pastoralists and livestock into the remaining land (World Bank 2006a; USAID 2006; FAO 2005a; Freudenberger and Freudenberger 1993). Until late in the 20th century, commercial access to forest resources was tightly controlled by the central government, and local authorities had no right to award concessions or usage permits. Legislation passed in the 1990s shifted more authority to local governments. A 1993 law added local collectives (i.e. rural councils) to the list of entities eligible to act as concessionaires in the use and management of forest lands. Under the 1996 Decentralization Law, rural communities could claim jurisdiction over forestland within their territory, and rural councils could administer forest policy according to a state-approved management plan. The central government has authority over classified forests and other designated forest areas (e.g., national parks, nature reserves) (Larson and Ribot 2007; Diaw 2006). The 1998 Forest Code provides that regional authorities and rural communities can exercise a variety of rights regarding forests, including demarcating forests and mapping forest uses and managing forest resources. Rural councils have advisory roles in issuing permits for hunting and forest-clearing and can issue preliminary tree- felling permits and collect fines. Under the Forest Code, the Forest Service is required to secure the rural council president’s signature before commencing commercial production within a rural community’s forestland. In 2005, a new Forestry Action Plan was adopted to encourage implementation of the Forestry Code (Larson and Ribot 2007; USAID 2006; Diaw 2006). All forestland is owned by the state, with authority to manage the resources devolved to subnational levels subject to compliance with the regulatory framework governing the forest type and permissible exploitation and the preparation of forest management agreements. In classified forests and reserves, products such as charcoal and timber are subject to quotas. In community forest management areas, the community and forest officials reach agreement on permissible forest uses, quotas, and revenue-sharing. In forest areas subject to the jurisdiction of the rural community, the rural council has authority to set quotas (Boye 2003; FAO 2005a; GOS 2004a; Diaw 2006). Despite a legal framework that allows for significant devolution of authority over forests and forest resources to local communities, most of the progress in devolution of authority has been in project areas supported by international NGOs and donors. Elsewhere, the transfer of authority has been less evident. Delays in decentralization and devolution efforts have been attributed to: ambiguity and gaps in the legal framework; lack of enthusiasm among forestry officials for devolution of authority to local communities; insufficient financial resources to support the local communities and forest service; and lack of capacity in local communities to undertake forest management (Weidemann Associates 2006; Diaw 2006; Larson and Ribot 2007; Ribot 2009). The Directorate of Water, Forests, Hunting and Soil Conservation and the Directorate of National Parks within the Ministry of the Environment and Nature Protection are responsible for the planning, implementation, and monitoring of national forestry policy. The Forest Production Research Directorate of the Senegalese Institute of Agricultural Research, which completes the administrative and technical arrangements for forest resources management, comes under the Ministry of Agriculture. A High Council of Natural Resources and the Environment, under the authority of the Prime Minister, has been established. The council is supported by an Ecological Monitoring Centre, which constantly monitors changes in the country’s forest cover (Diaw 2006; FAO 2003). At local levels, a variety of governance bodies engage in forest management, including rural councils. In a pilot project involving 16 villages surrounding the Ndankou classified forest and protected areas, village committees were formed to implement a participatory forest management plan. Representatives from each village committee served on a federated inter-village committee that oversaw the project area and maintained the relationship with the Forest Service. Village committees defined areas of forest use and managed access and exploitation of the forest in accordance with project objectives (Boye 2003). Senegal’s sedimentary basin stretches over 75% of the country’s land mass and, together with Precambrian basement formations in the country’s southeast, houses a significant variety of minerals, including phosphates, limestone, salts, iron ore, copper, chromium, gold, platinum, uranium, and natural gas. The country’s mineral sector has been dominated by production of phosphates, limestone, and attapulgite, but foreign interest in Senegal’s diversity of mineral wealth has grown, with multiple operations exploring deposits of iron ore, zircon, titanium, gold, and uranium. Senegal has encouraged development of the mineral sector with investment in geophysical surveys, geological mapping, and development of centers for mining documentation and a mining cadastre (Aspermont UK 2009; Bermudez-Lugo 2009; Ngom 2010). Phosphates have led Senegal’s mining operations since the opening of two large mines in the Thies region (about 70 kilometers outside of Dakar) in the 1940s and 1950s. Reserves of calcium phosphates are estimated at 100 million tons and 50–70 million tons of aluminum phosphates, which together give Senegal the potential to be among the top 10 phosphate producers in the world. Phosphates and their derivatives have accounted for 7–15% of reported goods sold for export in 2004–2007, but have not taken advantage of the world market for phosphates because the country’s dominant producer, Industries Chimiques du Senegal (ICS), sells most of its production to India. Phosphate exports have also been interrupted by financial difficulties with ICS. Expansion of phosphate production and diversification of producers is expected to increase the share entering the world export market (Bermudez-Lugo 2009; EIU 2005; Aspermont UK 2009; IMF 2008). The country also produces gold, basalt, cement, salt, sand, natural gas, and petroleum. The Sabodala gold mine in the eastern part of the country began production in 2009; the site has an estimated 30 tons of gold reserves. Large- scale deposits of iron ore (estimated at 600 million tons) have been located near the eastern border with Mali (Bermudez-Lugo 2009; SIM Senegal 2010). Senegal’s fossil fuel resources, while relatively minor, are important for domestic purposes because thermal resources generate nearly all the country’s energy. Senegal has an estimated 52 million cubic meters of peat, which can be made into bricks that provide an alternative to fuelwood. The county also has lignite and coal, and natural gas is being extracted from the Gadiaga field, south of Dakar (EUI 2005; Aspermont UK 2009). Senegal’s Mining Code of 2003 (Law No. 2003-36) was designed to attract foreign investment and promote development of the country’s mineral sector. The 2003 Mining Code, which replaced the 1988 law: grants foreign and domestic operations equal protection for their investments; extends incentives for exploration and exploitation of minerals; reduces transaction costs for mining companies by processing requests for permits within 45 days; provides for international dispute resolution; and imposes environmental protection standards on mining operations. The 2003 Mining Code meets the norms stipulated by the 16-state Organization for the Harmonization of Business Law in Africa (OHADA). Decree 647 of 17 May 2004 supports the 2003 Mining Code with implementing regulations (Aspermont UK 2009; Ngom 2010; Reynolds and Flores 2009). Senegal’s Mineral Policy Statement (2003) provides for the abandonment of state monopoly over any mineral resources and refocusing on regulating private mining companies. The policy statement limits to 10% the state’s participation in ventures and encourages participation of private investors, both domestic and foreign. The state will also support the diversification of mineral production and the beneficiation (initial processing) of mineral products before export in order to generate employment opportunities in the industry. The statement provides that 20% of all revenues received should be directed to local communities. The mechanisms for that revenue sharing are not identified (Ngom 2010; SIM Senegal 2010; Sylla 2005). Research Permit. Research permits are issued for three years, with two renewal periods for reduced territories. After the second renewal, one more exceptional renewal is allowed for a duration equal to or shorter than the length of the original permit. In the case of multiple applicants, priority is given to tender offerings that provide the best conditions and guarantees for the state. Exploitation Permit. Also renewable but initially granted for a period of five years, this permit requires execution of an Environmental Impact Assessment. Mining Concession. Mining concessions are granted for an initial 5-year term, with renewals up to 25 years. The concession cancels any exploration permit still in force. However, by decree, applicants who meet set standards of technical, managerial, and financial capability will retain their rights under the exploration permit (Aspermont UK 2009; Ngom 2010). Disputes between Senegal and foreign investors may be brought before any arbiter of the parties’ choosing, including an international arbiter (Ngom 2010). The Ministry of Mines, Industry, and Small and Medium Size Enterprises (MMIP) is responsible for monitoring and control of the mining industry. Application for permits and concessions must be made to MMIP, specifically to the Directorate of Mines and Geology (GOS Mining Law 2003). The growth of Senegal’s mining sector has been constrained by its lack of infrastructure, particularly the railways, roads, and port facilities needed to carry production from the southern and eastern parts of the country to ports for shipment, and the lack of sufficient energy throughout the country. Senegal is investing an estimated US $911 million annually in public works, including highways and power plants, but the investment is half the amount that the World Bank has suggested is necessary. Foreign investors such as Arcelor Mittal, which is developing US $2.2 billion in an iron ore mining operation in the Laleme region in the southeastern region of the country, are also investing in the development of infrastructure, including 750 kilometers of highway and expansion of the port in Dakar (Bloomberg 2010; Business Wire 2007). The legal framework that Senegal’s government enacted in 2003–2004 to govern the mineral sector was designed to create a transparent, non-discriminatory, simple system for obtaining and exploiting mineral rights. The framework is supported by a national commission to combat corruption and promote transparency in government operations, new standards for public offerings and fiscal reforms designed to encourage foreign investment (Ngom 2010; Aspermont UK 2009). Through its Mining Sector Support Programme (PASMI), Senegal has sought to integrate artisanal miners into the formal mining sector by improving mining techniques and the livelihoods of small-scale miners, with a particular emphasis on the most vulnerable groups. The project focuses on gold miners in the Kedougou prefecture in southeastern Tambacounda, where approximately 70,000 people live in 10 rural communities (Savornin et al. 2007; Aspermont UK 2009). Development of Senegal’s mineral sector has been aided by the EU-supported, EUR €13 million Mining Sector Support Programme (PASMI), which began in 2007. Under this cooperative program, Senegal has: engaged in intensive aerial geophysical surveys of southeastern Senegal; established a center for mineral documentation and a mining cadastre; conducted geological mapping of the sedimentary basin and southeastern Senegal; and provided support for artisanal miners. Employment in the formal mining sector is low; only about 2500 positions were reported in 2006. Donors such as the World Bank have identified the need for support for the country’s efforts to diversify the industry within the country in order to provide more employment opportunities and ensure that local communities benefit from investments in the sector. Senegal’s Poverty Reduction Strategy Paper (PRSP) (2007– 2010) identified the need for donor support in the development of processing of mineral resources and research into new applications for mineral substances to benefit local communities and help diversify income sources (World Bank 2008; Aspermont UK 2009; World Bank 2006).